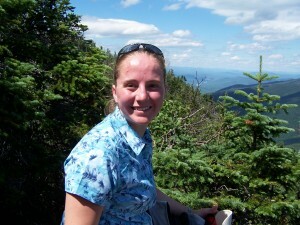 At a scenic lookout Wildcat Mountain during my first major hike back in July of 2005. 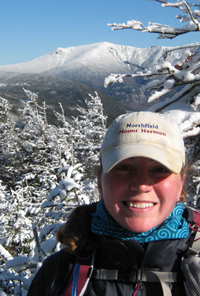 When I first started hiking back in 2005, my first big trip was the Wildcats in New Hampshire. For those of you not familiar, the Wildcats are a series of five peaks that contain two peaks on the Appalachian Mountain Club or AMC 4,000 Footer list for New Hampshire and New England and, based on the route I took, cover 10 miles of trail. I had hiked some smaller “mountains” in the weeks leading up to it, but the Wildcats were my first test. And I felt like I didn’t study. My poor friends on that hike practically had to push me up the trail while listening to me huff and puff and complain. Why any one would want to hike something so tall, during July of all months, was absolutely beyond me. And, to add insult to injury, many of my friends were these people called “peak baggers” that did this kind of thing for fun every weekend. I determined that, without any doubt at all, these people must be insane. Hiking that much just wasn’t natural. It was stupid. Needless to say, to get to the point, I was back out on the trails the next weekend. I just didn’t give up. I was determined to “bag” as many of the AMC 4000 footers as I could before the snow forced me inside. But, sometimes you have to know when to stop. And turn around. And head home. And it stinks. My first taste of winter hiking. And the first time I turned back. I learned my lesson for the first time late that fall. Being a novice hiker, I just did not realize how early winter came in the mountains. Why I hadn’t realized it before was beyond me. But I took a deep breath of the bone chilling cold air and started tromping up the trail with my merry band of hiking buddies. My boyfriend (now husband) and best friend all agreed with me that we’d go as far as we safely could. Given that I was out to bag two peaks that day, I was more than a little determined to get both of them. In fact, I felt like I had to. I wanted to get as many done in each day as I could so that I could get my coveted AMC patch. I was determined. And my determination was unwavering. That is until we started to get closer and closer to tree line and the snow started getting deeper and deeper. I was prepared. Or at least I felt like I was. But it became very clear to me that I was really wrong. I didn’t have the proper winter gear with me. Most noteably, I didn’t have snowshoes. Or good winter gloves… the list could go on and on. It was very obvious to me that I was very deep in over my head. And yet I kept on going. All the way until the first summit. The view was absolutely incredible. The ponds below us in the valleys were covered in ice. The trees were barren and exposed the rocky, white speckled peaks and crevices below. I could see Mount Washington as clear as though I were right there. It was a picture perfect day. But my boyfriend and my best friend both knew that we had to turn around. It was just getting too late. Getting too cold. And at least we had bagged one peak. One was better than none. And I was happy to have one peak to cross off my list. Knowing that it was time to turn around just may have made the difference between getting home safe and back to warmth that day. I dare say that anyone on the trails can recognize the hazards that winter hiking can pose. And that is certainly a concern and a definite reason to turn back. But my reason for these stories, given the time of year, is to remind you that it is never the “wrong time” to call it a day. This past weekend I took my mother and our pups for their first hike of the season. My mother used to be an outdoor buff back in her day, but the arrival of my sister and I quelched that activity and a bad ankle break a couple years ago definitely made her very tentative on the trail. Now that I’m beginning to get her back in to it, I thought that a small hike on a local mountain would be the perfect way to start boosting her confidence. The weather was gorgeous. A tad on the warm side, but we’d both take it instead of being stuck in the rain. So we hit the trail in optomistic fashion with the idea to reach the south summit and then make it back to my car in time for a late lunch. We felt pretty prepared and had tons of water for us and the pups. We had covered ourselves with what felt like gallons of bug spray. We were ready. Mom and the pups were both doing awesome for a large portion of the trail. It was a bit challenging to my mom and her newbie trail pup, but it seemed to be just the right speed for us. That is until we realized that there was absolutely not breeze whatsoever. Why is that so bad? Um, the black flies have been ragging war in the mountains this spring! It has been absolutely insane. If I stopped for a moment, I’d be more likely to inhale bugs than air. Of course I am exagerating, but you get the idea. It was not fun. I can handle the bugs and I actually don’t tend to react to the bites at all. My mom, on the other hand, soon began to make it clear that my original mission of this short, easy, fun hike was completely blown. I knew that we weren’t far from the south summit and I desperately wanted to get that one easy peak in for the day and be able to see what the incredible view looked like on such an incredible day. But my mom wasn’t having fun. So I told her we could go back. No hurt feels. No problem at all. I’d even crank the AC in my car for her. She was very much in approval of my idea. So back to the car we went. I swear that she practically flew down the mountain to get away from the bugs. And the two pups were certainly making quick work of pulling us down as well. We hopped in to my car as quickly as our packs came off and we were off in the bug free, air conditioned comfort of my car. Was I bummed that we turned around? Yes, I was. It was a gorgeous day (minus the bugs) and it felt good to be out on the trail. But I don’t regret it for a minute since my mom said that she’d go out again once those pesky black flies finally die. What the heck is the moral of my rambling? It’s simple. It is absolutely never wrong to call it a day and turn around. It doesn’t have to be in the middle of the winter when your safety is obviously in danger. As soon as you stop enjoying it, you should head back. The trail is not there to cause you pain or teach you a hard lesson. And it will be there for you when the day is going better. Get out there. Have fun. And when you stop having fun, head home. It can be easy to become focused on reaching a location (lake, summit, etc) and lose sight of what is really important…having fun and returning safely.